At yesterday’s Delaware County Council meeting, a contract was approved for emergency repair of the streambank at the base of the sledding hill in Glen Providence Park, and of the hillside above it. This area has been suffering from erosion for years, which was worsened in August 2011 by Hurricane Irene. 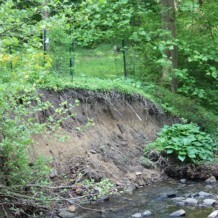 That erosion prompted our first streamside buffer plantings in April 2012, in an effort to reduce further streambank deterioration. Since then we have had more record torrential rain, with July 2013 second in all-time rainfall only to August 2011, and heavy precipitation this winter (in the form of snow!). This spring, more of the streambank started collapsing, and when we visited the site with Brian Vadino from the County Conservation District on May 2, he was alarmed at the degree to which the streambank had deteriorated. This led to a visit with the County Engineer this week, and the emergency measure. I spoke with County Parks & Recreation Director Marc Manfre and Brian Vadino for more information about the repairs. For the design, the County is taking aesthetics and habitat restoration into consideration. They will first remove (and preserve) our plantings, then reinforce the streambank with dry stacked stone – the most attractive option for this highly used area. They will re-plant the trees and shrubs when they are done. They will both repair the eroded gulley uphill from the stream (at the base of the sledding hill), and create a berm to direct the water to the sides of the hill, to prevent future erosion. Weather permitting, all of this will start as soon as permits are in place, as soon as Monday, June 9. There will be more planning needed to more permanently address erosion along the pond and stream, as we previously wrote about in Upcoming Changes: Pond & Wetlands. Management of natural lands is a huge task, and Glen Providence Park is just 33 acres of over 600 acres that Delaware County Parks and Recreation manages! We are incredibly grateful to Parks and Recreation and the Conservation District for their quick response and thoughtful planning to remediate the erosion, and to County Council for approving this emergency measure.